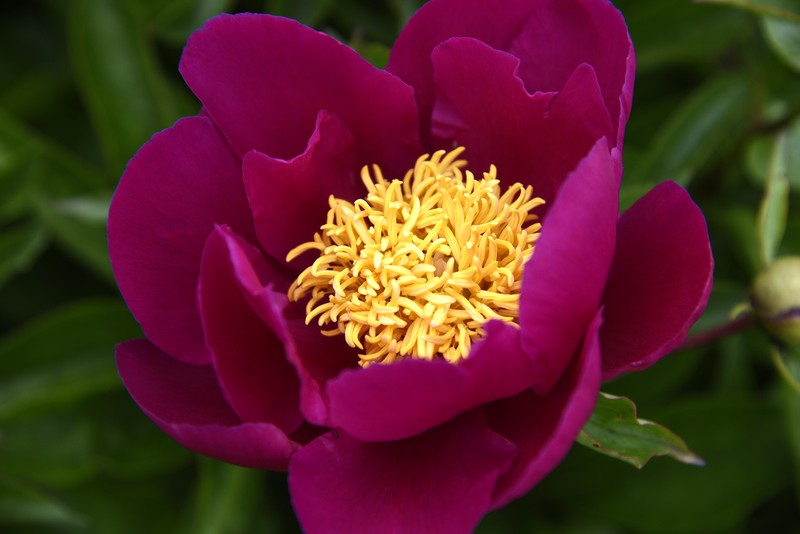 We visited Aspelund Peony Gardens in Kenyon today. When we arrived, a friendly dog greeted us. How did he know that I needed an animal photo for Cee’s Black and White Challenge? By the time we left the place, we were content. I miss the dog though… a little bit. All the flowers are pretty. I really like the angle of the last photo. As for the dog….cute!!! Thanks, Tree. I am glad you like the last photo. I have knee problem so it is hard for me to squat down to take this kind of photos. I simply aimed, clicked and prayed, didn’t even see it from the viewfinder. 😉 I was happy that it worked. It does get more difficult to get down for those fun shots doesn’t it?! Thanks, Mabel. The dog barked when we arrived. 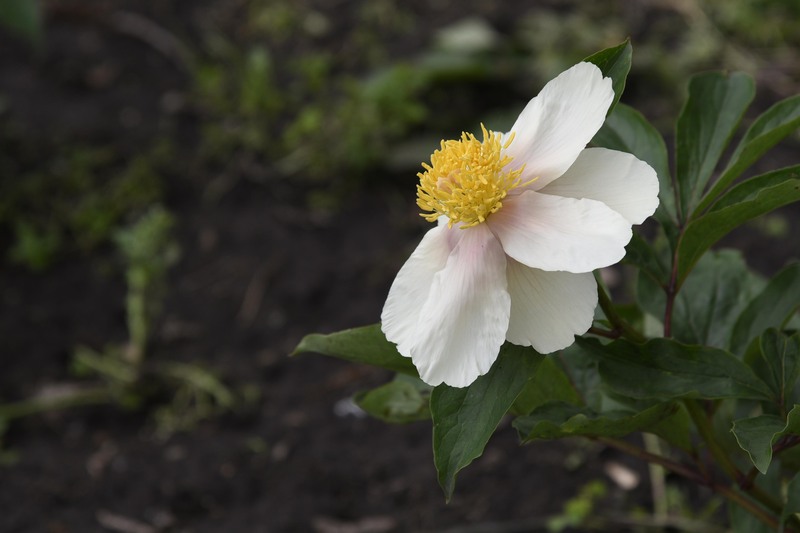 I sent my husband out first to make sure the dog wouldn’t bite us 😉 It was a nice garden that has many different kinds of peonies. I think I may go back to take more photos one of these days. 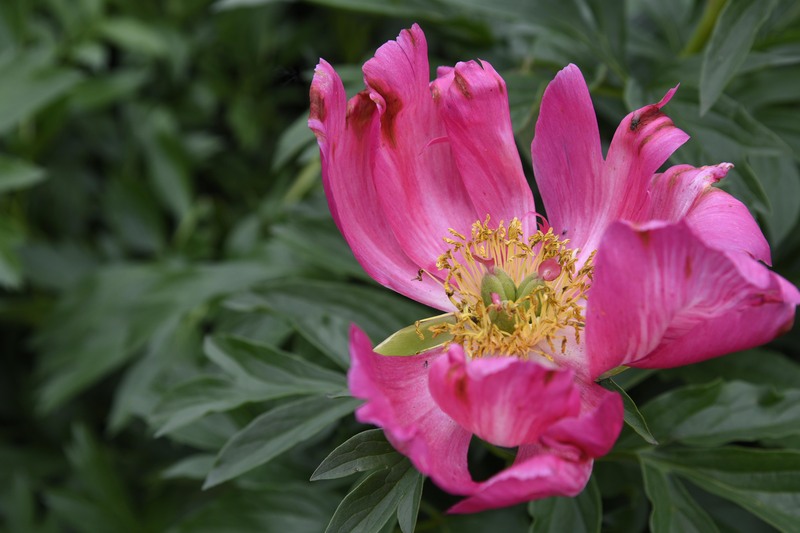 These photos are all superb, but I especially like the dog one, and the last of the peonies. When I think of peonies, I think of my grandmothers: white, pink, multi-ruffled. These are a complete revelation. 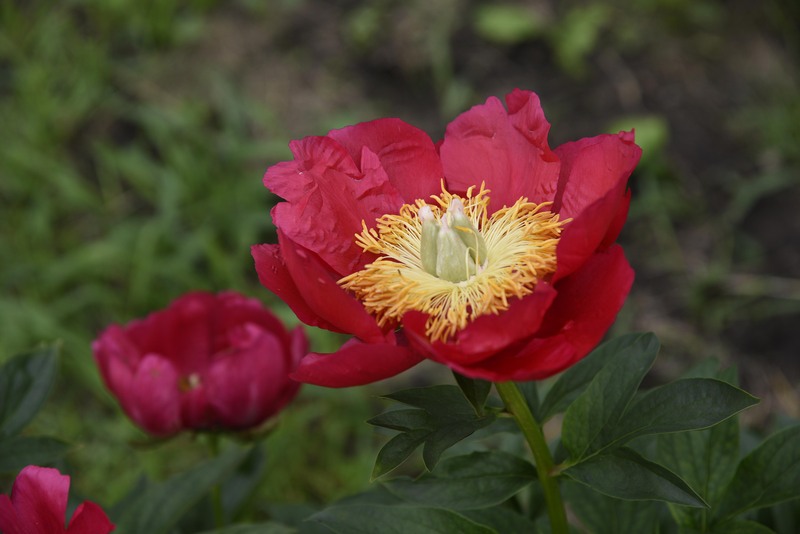 I had no idea peonies could do that! 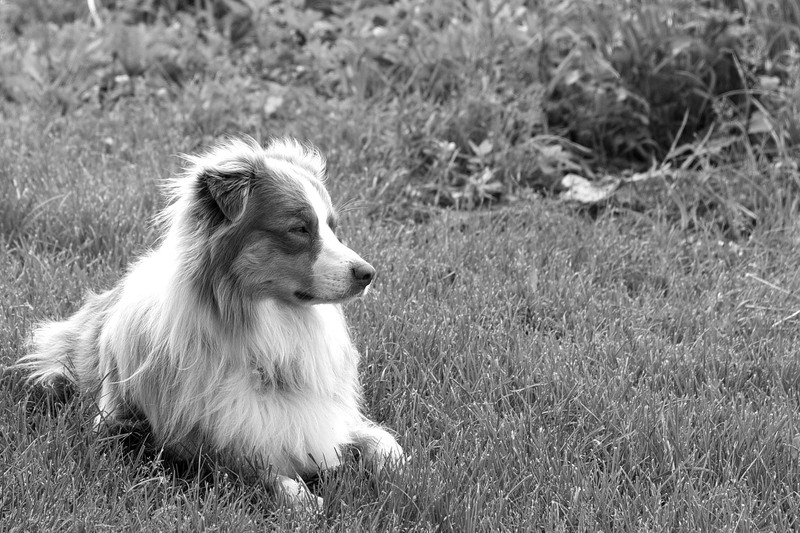 I would caption this ‘Regal: Dog in Black & White.’ What a great photo, Helen. The flowers are very pretty, but you know me–love the animals. Thanks, Lois. Yes, I know you… 😉 I do like dogs, but at the same time I am a little afraid of them because I can’t read their mind and don’t know if they would bite me ;-( I didn’t get out of the car until I made sure the dog didn’t bite my husband. Ha. Ha! Helen, this is so funny! Dogs definitely know what we need at times 🙂 Love your photo of him. 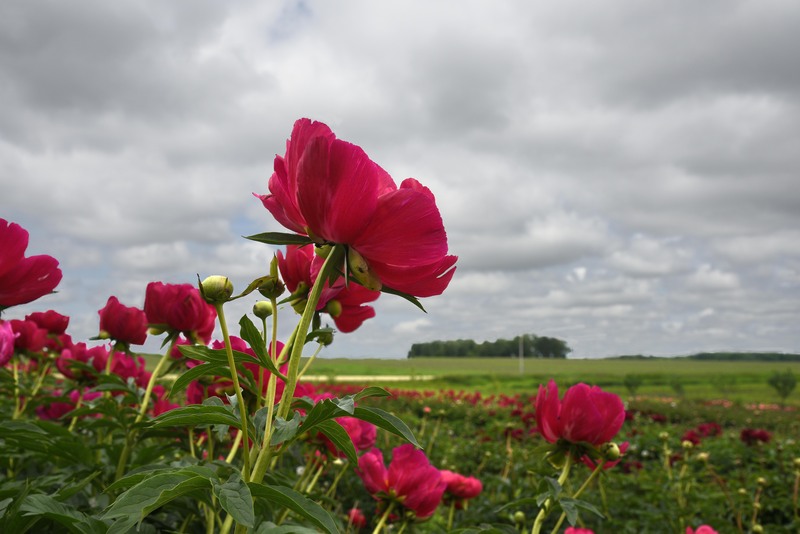 Now your peonies are absolutely stunning. Each one is awesome for different reasons. I think I like the last one the best because you got such depth beyond the peonies. Thanks, Cee. It is a smaller garden, comparing to those you have visited, but it is a garden and I am grateful 😉 I plan to visit other gardens in MN, hoping there are some good ones 😉 You’ve inspired me, and thank you. Thank you, Nancy. I love your photos! You seem to know exactly what you want from a photo. I am still experimenting 😉 Someday… I keep saying that. Ha. I’m drawn to the monochromatic image of the dog. It’s expression seems so intent and serious, and the conversion helps to focus on that feature. Thanks, Sally. That was a nice dog. In the beginning, he (or she) didn’t want a photo taken and would walk away when we raised the camera. We worn him out, I guess. Ha. sweet dog and beautiful garden. Thanks, Ruth. I appreciate you took time to stop by. Thank you so much! I love your photos; after translated the words to Chinese, I had no problem reading your posts. Yeah!